Growing up, my parents loved to cook foods from around the world, but they especially loved to cook Chinese food. I think this is where I get my love for Asian inspired cuisine. 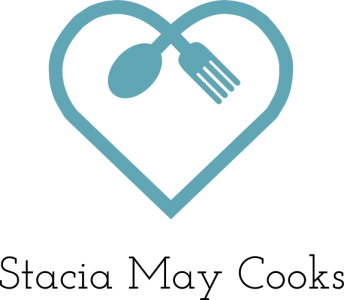 My mother would also often cook from The Moosewood Cookbook, which is from the famous vegetarian focused Moosewood restaurant in Ithaca, New York. The recipe I’ve adapted today is Sichuan Noodles from the Moosewood Restaurant Favorites cookbook. I added chicken because I was craving protein and I love the flavors of chicken with a peanut based sauce. The original recipe suggestions cucumbers and scallions as a garnish, but as I did not have them and I was too hungry to run to the store, I replaced them with peppers and onions. Tasted great to me! 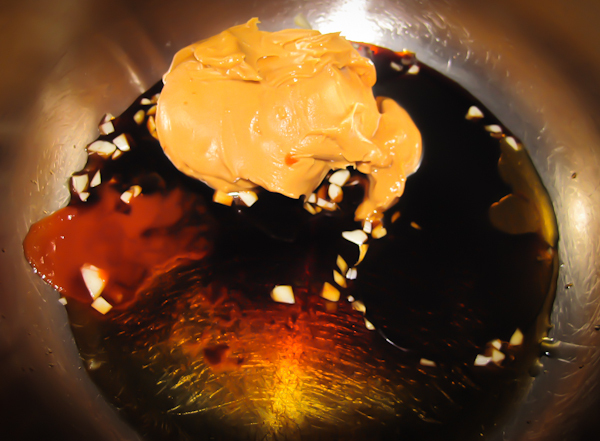 The sauce was a delicious peanut butter base with soy sauce, garlic, sesame oil, vinegar and chili paste. I used rice vinegar and sriracha. I added a little white sugar to sweeten it just a bit. I took two chicken breasts, seasoned them with salt and pepper and cooked them in a frying pan over medium heat. 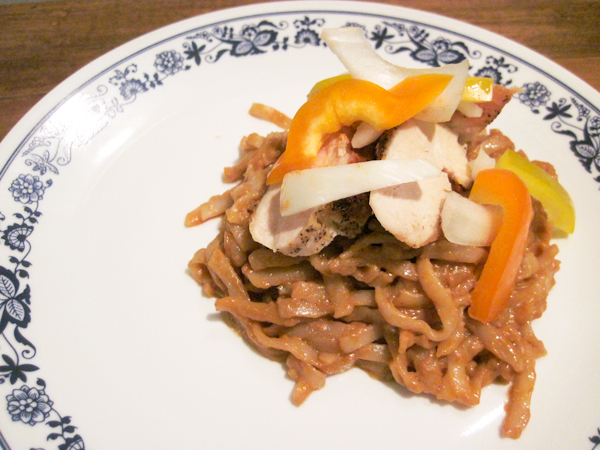 I used quick cook pad thai noodles as the noodle base. I cooked them in the sauce, topped with chicken, peppers and onions and served with love to Dave. He loved it! Stir together peanut sauce ingredients and set aside. 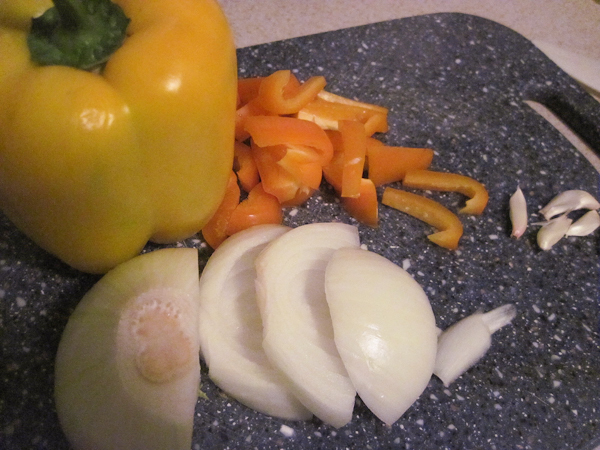 Prepare onions and peppers and set aside. 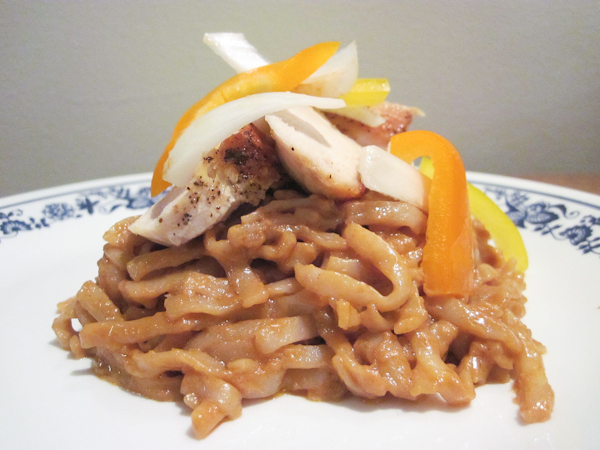 If using traditionally cooked rice noodles, cook to package directions and set aside. Salt and pepper chicken breasts to taste. In a large skillet heat olive oil over medium and place the chicken breasts in oil to cook. Cook through, turning often so as not to burn the chicken breasts. Once cooked through, slice breasts into strips. Warm a splash of sesame oil in a large wok or high sided frying pan over medium high heat and add noodles. Pour peanut sauce over noodles cook together, stirring constantly for about 2 minutes. Serve noodles topped with chicken, pepper and onions. Enjoy! Haha! I think you would like I Linz, and it’s easy to make!